I’ve got a bad feeling about the Euro: the structural imbalances I presented yesterday irrevocably doom the single currency. Since the euroland leaders have invested their prestige and credibility in the single currency euro, it’s demise will likely be cloaked in some “face-saving” measure. My best guess is euro-denominated bonds, both public and private, will be offered in two flavours: “euro 1” for mercantilist Germany, France, the Netherlands, etc. 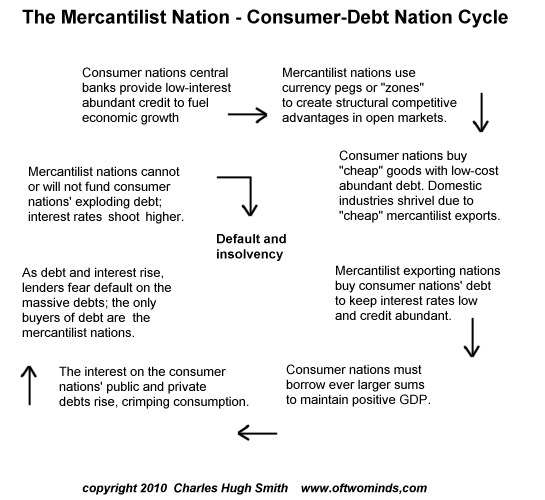 and “euro 2” for the highly indebted, debt-and-asset-bubble-dependent consumer nations: Portugal, Ireland, Italy, Greece, Spain, etc. 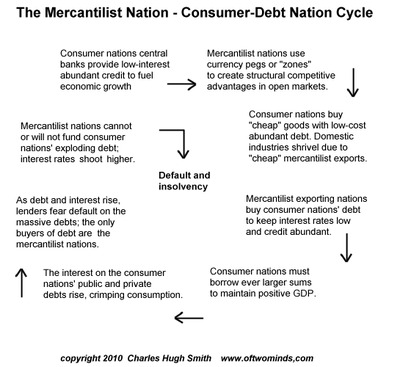 This could be a de facto (unofficial) “solution” to repricing debt and assets in each nation, or it might even become “official policy” as the great structural divide between mercantilist and consumer nations become unbridgeable even rhetorically. Eventually, the “euro 1” currency will be valued more highly than the “euro 2” currency–again, either de facto or de jure. If the E.U. prefers total denial as a policy, then the revaluation/devaluation will be de facto; the “street price” of euro 2s will be worth less in the real world even if the E.U. maintains the fantasy of a single currency. China has already decided on its de facto policy on dollar-denominated debt: it is selling longer-term T-bills and buying short-term Treasuries as a way to limit its long-term risk to rising interest rates; the short-term T-bills offer a liquid market to “park” its dollar-denominated earnings. China’s strategy will pay handsome returns if the dollar strengthens and interest rates rise–both possibilities I consider highly likely. Right now the dollar doomsdayers are still holding sway; commercial interests are long the euro but they are playing with fire. The structural imbalance outlined above will not go away because it is inherent to the euro itself; it cannot be papered over for long. As for China, I suspect that nation will be drawing down its foreign reserves to fund various make-work “stimulus” and social safety-net programs to calm domestic restiveness as the global economy devolves. Thus Chinese selling of Treasuries should not automatically be interpreted as “financial warfare;” it might be that having squandered trillions of yuan on absurd and unneeded real estate developments, China actually needs its cash to fund domestic initiatives. As the structural flaws in the euro and China’s mercantilist economy become undeniable, then global capital will flow to the one remaining liquid market: the U.S. dollar. Yes, yes, I know: “that’s impossible.” Yes, just like the housing bubble wasn’t a bubble, and housing never goes down in value, etc. Structural imbalances cannot be denied forever.